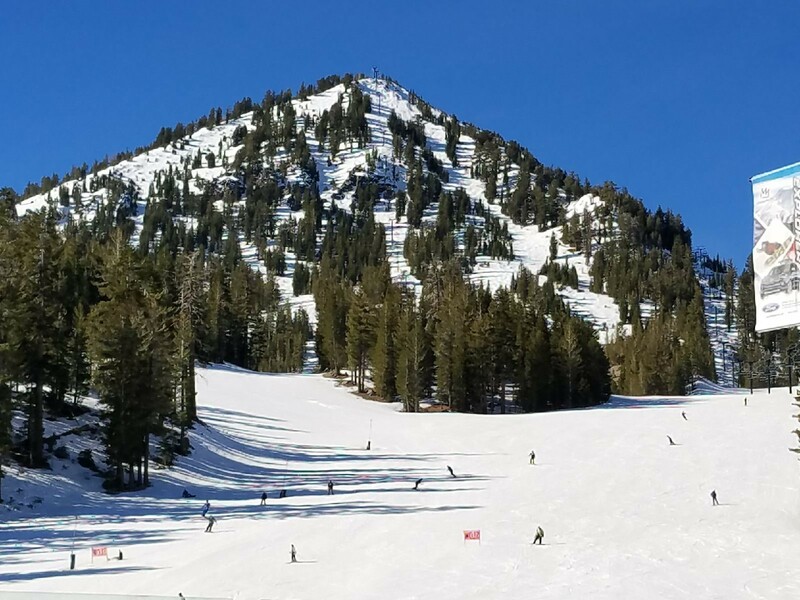 A successful trip to the mountain does not start when you roll into Mammoth Village, Big Bear or any other resort. That was the saying when I was younger that would translate into something like “Fools in the mountains”. The saying was so common; there was a television show about it. That is why our yearly trip to the mountains offers a unique opportunity for everyone, from the most seasoned skier to the not so seasoned skier. 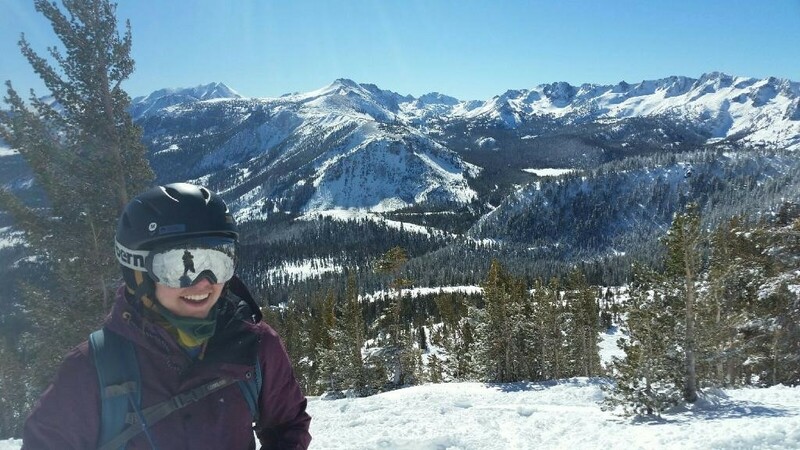 There is no need to chase the storm or scout out the best deals for shopping, lift tickets or lodging by your lonesome! No worries…these details are sorted out, a combined effort by all branches in the section, preparations begin months in advance. Epic conditions can still be had, by praying to the snow gods. Feeling like you’re not the mingling type? The large group of people increases the fun, and it is an awesome opportunity to meet people from other branches in the LA Section. 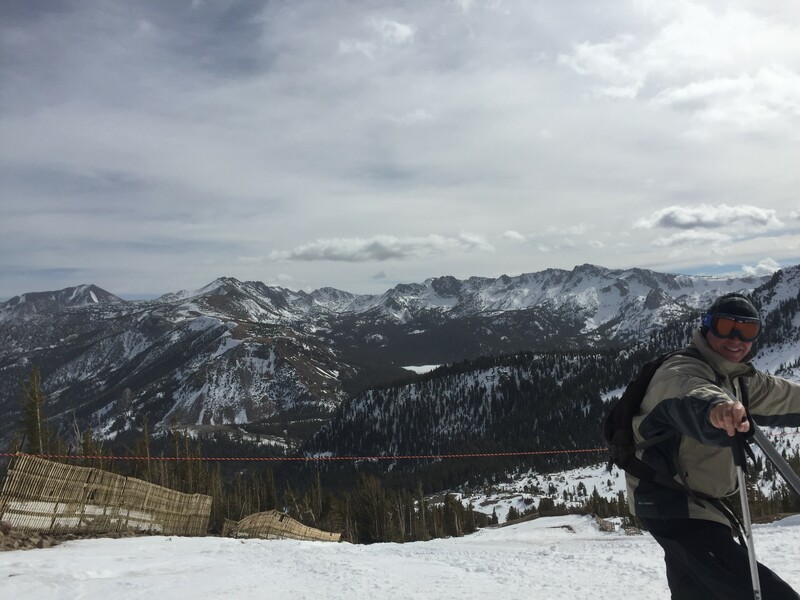 Information about lift tickets, rentals and other advantages flow freely as well, so all you have to worry about is leaving at the right time. I strongly suggest carpooling. It is always a good idea to pack along your favorite drinks and snacks, not many savory dining options on the way toward the mountain. When we arrived in Mammoth, the rental office was closed. After making brief contact with the LA YMF chairperson, we grabbed the right envelope with keys and parking passes on the office door and checked into our assigned condo. The place was well equipped and moving in was a breeze. My friend Jake and his party arrived shortly after, and soon after that people from the nearby condos showed up for a meet and greet. We relaxed and enjoyed the surroundings and talked about our unique professional experiences in a relaxed atmosphere. During the first night in the mountain it is important to curb your enthusiasm and get an early night sleep. Remember you are at an altitude that reaches far above 10,000 feet at the top of the mountain, listen to your body and give yourself time to acclimate. Relative high temperatures were expected for the next day, and we wanted a taste of the nights grooming effort in the morning, the early bird catches the corduroy. What a day! Snow came late this season, but I have to admit that it is amazing how the crew was able to keep up the mountain. The sunny day ushered in perfect conditions, hardly any wind. We knew we were in for a real treat. Conditions were amazing the first three hours, after which it got a bit heavy. Oh well, time for a beer! 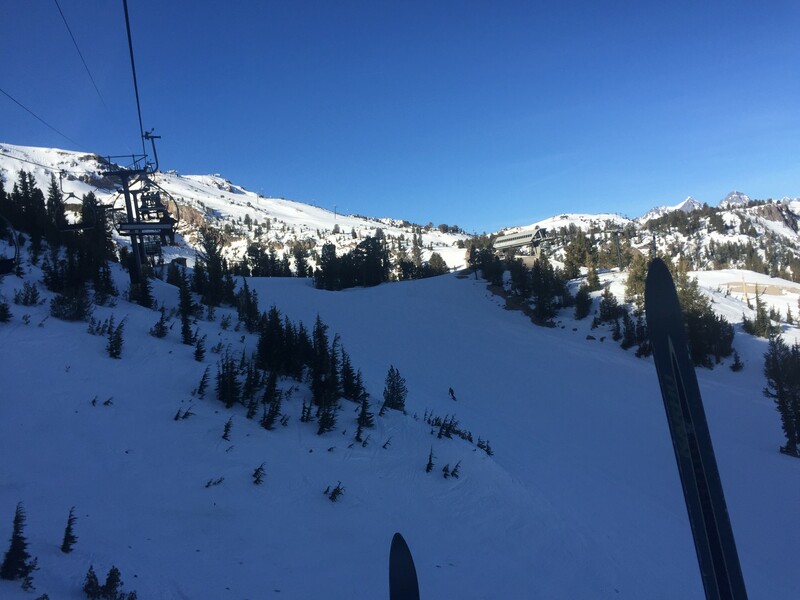 We skied out of Canyon Lodge, with easy access to the gondola. The gondola works well as transportation between the condo and the slopes. With the mix party of skiers, and not so skiers, it is also a perfect way of meeting during lunch. Sometimes you can get lunch faster even by taking the gondola down to the village and have lunch there in less time and with shorter lines. There is so much to do, and we shaved half an hour off full lift time to avoid the crowd getting off the mountain, at the market, and in the Jacuzzi. Just perfect! We got supplies at the local grocery store after taking shopping requests. Although we took a little time out to supply up, there was no worry about missing out on any other activities available. This coincided with the time when everyone was hanging out, sharing food and drinks in a somewhat organized fashion, it was low key and delightful. During our first night out, we visited the Mammoth Brewing Company. The theme was different than I remembered; it must have changed owners at least three times since I had begun visiting the Mammoth resort. It has always been a favorite among the local population. When we arrived, we took a glimpse of the massive line to order food. At first glance, the line seems a bit overwhelming but you had to ask yourself why people remained in that massive line? Believe me, there was a good reason! Coincidentally, the line for food was conveniently located next to the bar. It’s safe to say that the long wait was eased by a variety of excellent beers on tap. 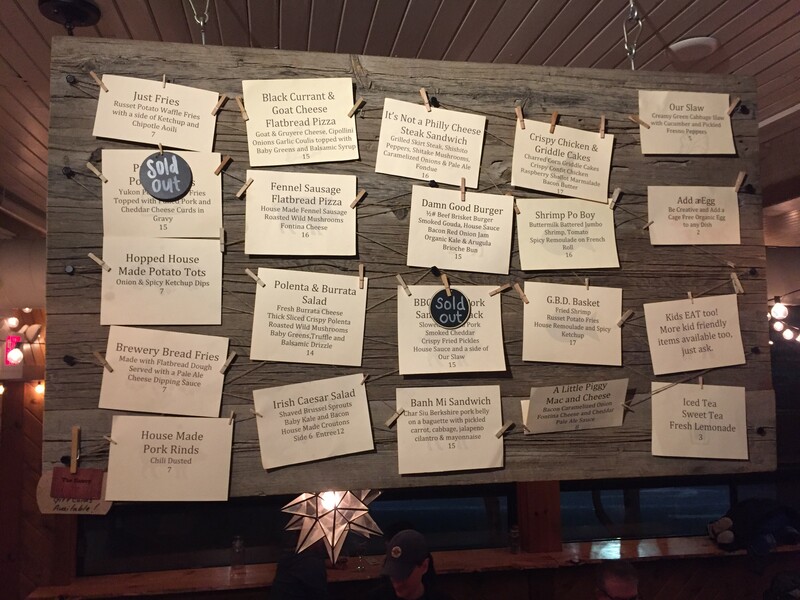 The restaurant appears to be a favorite among the locals, as well as a great spot for families to dine out after hitting the slopes. In an instant, the place transformed from a restaurant into a nightclub, and with a very entertaining live band to boot, and the food…well worth the wait! The second day of skiing is when we try to ski and hang out with new and old friends from the previous night’s networking. It was another amazing day, and time to take a lot of pictures. 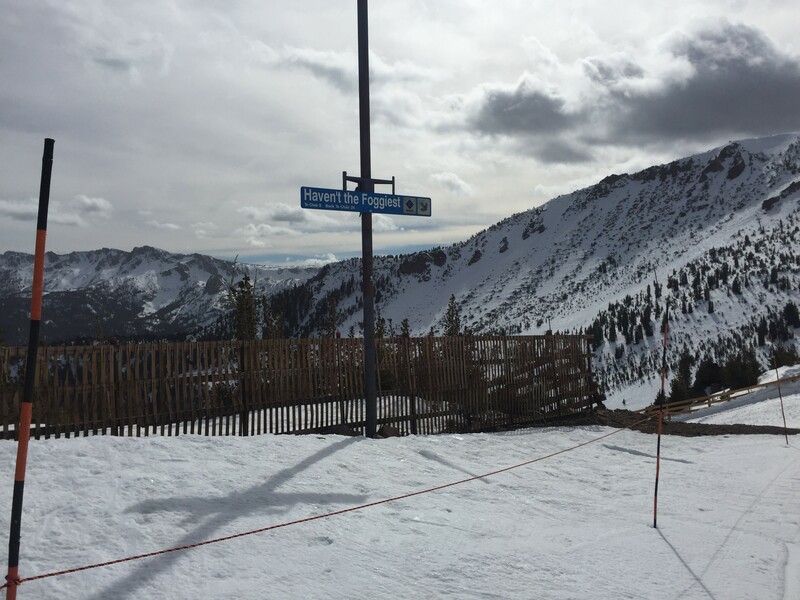 The mountain is usually a lot colder this time of year, but spring conditions are always welcome, even in February. I skied in the group of five with all different levels and try to catch up with the rest of the people during breaks. Saturdays are usually the big night out, and a couple of my friends headed down to Lakanuki, in order to reserve tables. This is another place to turn into a nightclub from a family restaurant on the secret handshake. Getting to Lakanuki late is rather expensive. At the time Jake, Michelle and I got there it was $20 cover, $5 wardrobe, and a huge line to get in with maybe an hour to go before closing time. We ended up at a brewery instead. When the brewery was shut down for a private party, we ventured into “local territory”, the area where the locals hang out. We eventually found this place that used to be an Irish pub and found it very welcoming. After chatting it up with the locals, we even got an exclusive invitation to the private party at the brewery we just left. Unfortunately, me and my short memory was in charge of the password. Sunday is leaving day, and always a bit sad, but there are still opportunities to take advantage of in the area. The local hot springs are very popular, and there is fishing and golfing just in case there is not enough snow to take out the snowmobile. There are outlets and areas for shopping for you bargain hunters. There are a variety of activities that would be perfectly suited to cap off an amazing outing. The longer you stay the less traffic you are likely to encounter on the way home. Still expect a five hour drive and make sure you are ready for the day after. See you next time on the mountain!